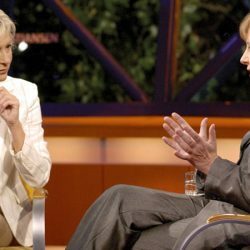 Sabine Christiansen (50) is Germany´s most acclaimed TV news presenter (“Tagesthemen”) and chat show host (“Sabine Christiansen”, a political discussion forum, which ran on TV channel ARD from 1998 until 2007). She’s declared her love of the island for many years and owns a house in the countryside, close to Andratx. In March 2008 she debuted as ambassador for the Balearic Islands at ITB tourism trade show in Berlin. 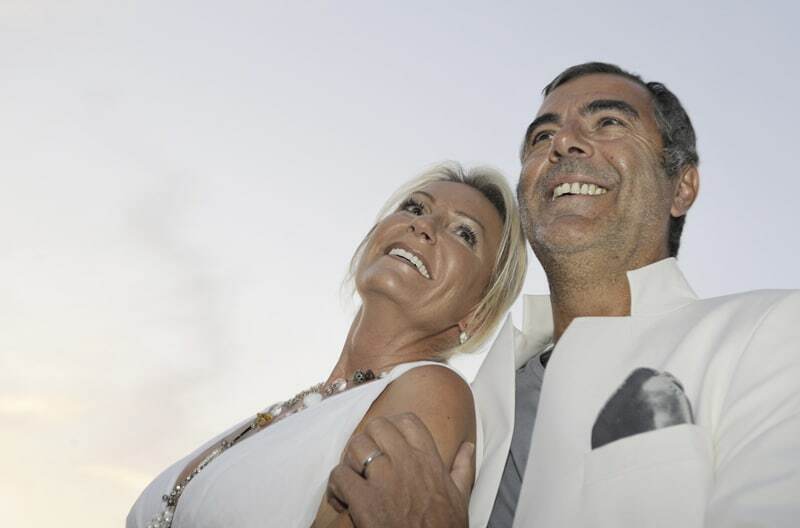 On June, 28 this year she took a more important personal step: Sabine Christiansen married French textile entrepreneur Norbert Medus (55) in a register office in Paris. One hundred and eighty celebrity guests joined the wedding celebrations on the Mediterranean islands of Ibiza, Tagomago and Formentera. As far as her job goes, the celebrated TV presenter from Northern Germany concentrates on the projects of her own production company “TV21”. Besides that, she does a lot of charity work for underprivileged children. Amongst others, she´s an ambassador for UNICEF and runs her own foundation (“Sabine Christiansen Childrens´ Charity”). Aren´t all of these roles too much for one person? I don´t feel overburdened at all. After having relinquished my political TV show in 2007, there´s more free space in my diary. After nine years of chief editing and daily pressure, I needed a change. The show I´m presenting now, “Global Players” on CNBC, is a once-a-week commitment only. What does the charity work mean to you? It´s very significant for me to be able to support foreign immigrant children´s integration in Germany. The commitment for UNICEF gives me the opportunity to join other NGO bodies. Together we can achieve more, providing professional education. For example, there are many refugee teenagers from Iraq in Germany who haven´t found social stability. All this work is cumbersome because it requires dealing with a lot of government agencies and a lot of repetition. This doesn´t attract the same media interest as visiting an African village inhabited by AIDS orphans. And if you want to relax you take a plane to Mallorca? Throughout the whole year we spend many weekends or longer periods in Mallorca. It´s a magnificent island, which offers so much more diversity than just a hot summer. Spring and autumn are the better seasons for playing tennis, going on a bicycle ride or exploring the countryside. In July and August it´s too hot. You are mainly living with your husband in France now. Do you have less opportunity to visit Mallorca? Fortunately he loves the Balearic Island as much as I do. We´re both glad to have the privilege to get away from the hectic pace of our vocations in our capital cities. Regrettably flight connections to Paris are not as good as to Berlin. How did you become ‘Balearic tourism ambassador’? I was asked to do this role by a Mallorcan friend. He forwarded me the Balearic tourism department´s wish to have a “person of conviction” on stage and not just someone as a media vehicle. As I always willingly promoted the island in the media at every opportunity, it was a pleasure for me to agree spontaneously. But not all of my friends, who love the island as we do, praise everything that´s going on here. A critical view combined with directness is necessary in every good friendship. Do you feel bothered by the overgrowth of the construction business? I have many opportunities to talk with local politicians about this issue. Certainly we, the foreigners, who didn´t come here to make property business, were irritated by the excessive amount of construction carried out in the past. Unfortunately, many Spanish investors were involved in home building projects which disfigured the landscape. However, Mallorca´s officials are strongly supporting changes. Only by doing so can they avoid the loss of important groups of residents and tourists. I hope they´ve understood that message now. Have you ever visited Playa de Palma – would you go there for a promotional performance? Naturally I´ve been there already – in winter time. Then it´s beautiful and almost lonely. A feeling similar to the German island Sylt when one goes out for a walk with the dog. For publicity gigs, other German celebrities come to mind, who’d be more appropriate than me! Should German and British people learn Spanish and Catalan when they settle here? I know many Spaniards who almost don’t speak French at all – although they’ve been living for decades in Paris. They argue that the affinity of French and Spanish is enough to understand the message. It’s certainly an advantage for foreign residents in Mallorca to speak Spanish, at least as an act of courtesy. If one wants to understand Spanish contracts and negotiate with local contractors, the language is very useful. I think Catalan (Mallorcan) is not mandatory. What do you enjoy most about the island? That depends on the time of the year. We like to keep our life private and don´t appear too much in the “in places”. What we always enjoy is meeting good friends, saving time for oneself and the family, slowing down the pace of life, being allowed to spend free time informally and in an easy-going way, with our privacy protected. Which places are your favourites on the island? Pollensa, the area of Binissalem, the Southwest behind the cropped coastline – certainly the sea and all these lovely small bays (I won´t reveal which calas I exactly mean!) where swimming and relaxing on a boat is such a pleasure. When did you first come to Mallorca? I remember my first visit some 20 years ago. A few years later I bought my first plot with an astonishing sea view. After some time it became too crowded in and around Andratx and I preferred to move further into the hinterland. Nowadays we can look across kilometres of green countryside and watch the harbour from afar. That´s how it should be. Why did you choose Mallorca, the synonym for mass tourism? Your husband is said to prefer Ibiza. We both feel highly attracted to the beauty of Ibiza and the Caribbean-style Formentera – especially in summer. Norbert has spent a lot of time in Ibiza in the past. His sons have grown up there with their mother. Mallorca is the perfect meeting point during the whole year and thanks to mass tourism we benefit from the extensive flight schedule. The emblematic “German lady” and the “island of the Germans” – a perfect combination? I don´t know – our mixed family is much too exotic for such a stereotype. It´s good when people of different nationalities come together in Mallorcan towns to spend their holidays. The impression I receive more and more is that Mallorca is populated as internationally as any other holiday destination in the Mediterranean. Is the island´s huge German community an advantage for you? Our gardener is Australian, our plumber´s a Frenchman, our carpenter and our architect are native Mallorcans; our friends come here for a visit from Germany, England, France, Italy, Russia and the USA. We have entangled lingos and an ambience of tolerance – no matter where one comes from. I´m an early bird. Have a long walk with the dog at 7.30 / 8 a.m., bringing home fresh bread and croissants for breakfast. Then playing tennis if it´s not too hot – the alternative is swimming. After that, two or three hours of work in the office. Then having a siesta, reading something, going for a boat trip. At 5 / 6 p.m. one more hour of checking e-mails, making phone calls. Later nipping down to the harbour of Puerto Andratx. I love buying the “catch” directly at the place where the fishing boats return after the tour. Then preparing the meal for many people sitting in the garden, having a cosy dinner. Watching the stars at night. How do you experience the media interest regarding your private life as a journalist? The paparazzi want to do their business well, which is understandable. But if somebody holds his camera in your face while you’re buying bread or visiting friends it´s too much. Once a telephoto lens was illegally held above our plot´s fence and a helicopter was flying at very low height right above our house in the afternoon. We only resist these things. Besides that we lead a normal life and even our recent wedding was celebrated without tents and walls on the Balearic islands. 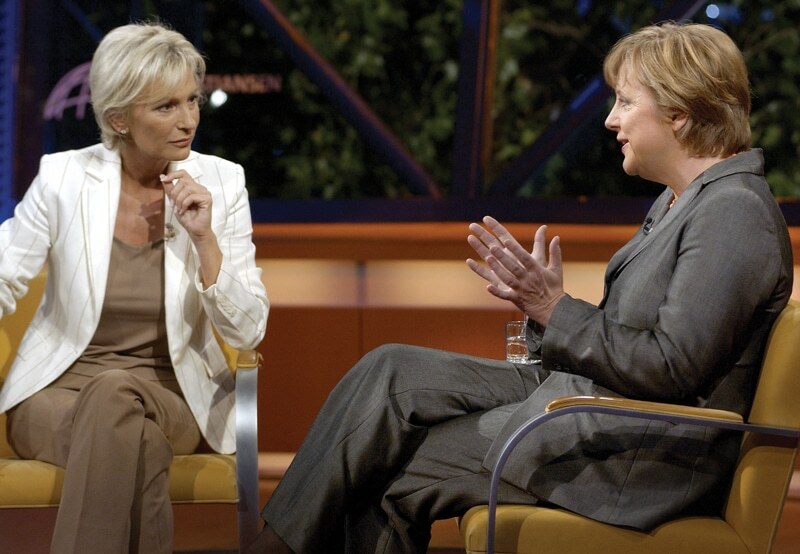 You gained a very high status in Germany with the chat show “Sabine Christiansen”. Qualities like courage, directness and sincerity were related to your name. Are you an example for the public? Over ten years, my editorial department and I marked the current political discussion. We managed this in fascinating political times, domestically and externally. It was a great effort. Sadly, some media criticized me exactly for my straightness, fairness and sincerity. But the longevity of the broadcasting format proved we were right. I´m amazed sometimes how great the public calling is for me to return to the “political journalistic front”.